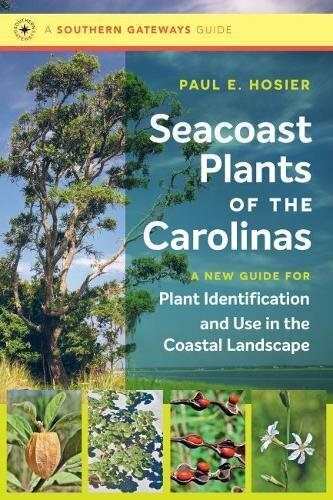 The plant life of the seashore is a fascinating world of its own. Edges are always challenging, and none more challenging than the margins of sea and land. 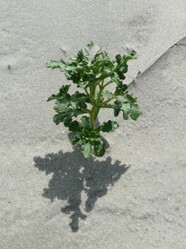 Some hardy plants face changes of conditions from salty wet to dry twice a day; others manage to avoid the ocean's tidal surges, but face salt winds that challenge their durability. 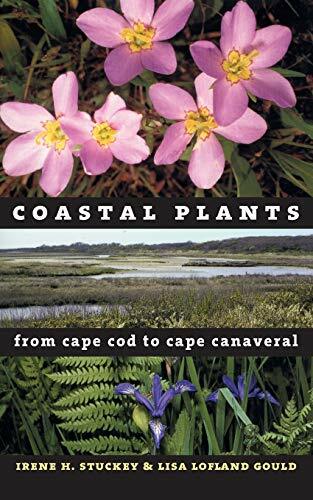 There are estuarine plants that thrive in the strange environment, neither salt nor fresh, of the estuary, and yet more cling to rocky cliffs,having found a niche there that other less hardy plants cannot thrive in. Truly the margins of sea and land are a wonderful world worth exploration. In the nineteenth century, before the days of radio communications, a small band of shipwrecked Britons clustered at the base of sea cliffs, their ship a disintegrating wreck and the mighty chalk bulk of Beachy Head above them. They expected to cling all night to the rocks through the storm, but a flash of lightning brought unexpected relief. One sailor saw a patch of rock samphire, Crithmum maritimum, growing on the cliff, and as he knew that this is a plant that never likes to grow in places where it gets wet, the tide would not rise to cover the spot. The desperate men scaled the cliffs to reach the samphire patch and clung on until rescue the next morning. Knowledge saves! But it was always a difficult plant to gather, and in Tudor times and upto the Victorian period, its harvesters, poor people, used to be lowered down cliffs with baskets to fill, a grim trade that led to many deaths. There is also the Hottentot Fig, which is found adorning the cliffs of the county of Cornwall, the only area of Britain where this import from South Africa can survive. There are issues with it, as many regard it as a troublesome invader and there have been efforts to be rid of it, but it is a beautiful plant with an edible fruit. Mind you, I am not short of food and so need not risk myself on the cliffs to get some. Many of the sea cliff plants are those of the land above, and you will see a rich variety of heathers and gorse, a plant so edible to animals that it had to evolve vicious spikes to survive. 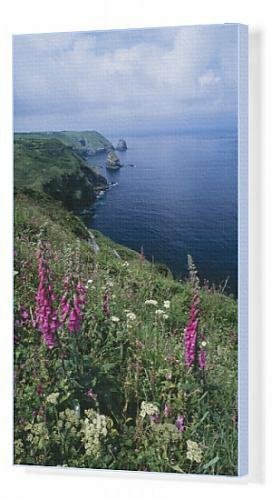 In the late summer the purple of the heather and the wild yellow beauty of the gorse combine in a cameo of beauty, and they both contrast with the lush glory of the sea pink. But one plant that you might spot on some cliffs, one that I have only espied once, atop a cliff top path in Cornwall, is wild cabbage. Edible it is, but do not pick it, as the wild variety is rare and fastidious in its choice of habitat. It is found at the top and bottom of cliffs, but rarely between the two extremes.The bottom is the wetter of the two, the top is where it is more likely to be picked and eaten. There are also lichens well adapted to maritime conditions.On the sea cliffs of the Lleyn Peninsula in Wales, which plunge dramatically down to small and secretive coves [bays] we find the ciliate strap lichen and the glory of the golden hair lichen,which interplay with heather, gorse and pink to paint a beautiful view for those discerning enough to stay and view. Sand includes beaches and dunes, and it has an interesting range of specialist plants. I have seen sea beet on the Anglesey beach. Beta vulgaris maritima is a plant with a rich genetic potential, and thus it has become the ancestor of chard, beetroot, sugar beet ,mangel-wurzel and perpetual spinach. Unlike several other plants,it is not rare, but foragers should take only a few leaves and desist from digging up the root, doing which is illegal in Britain, for you are not permitted to dig up a wild plant except on your own land or with the landowners' permission. Crambe martima, sea kale, is quite rare. The example that you see above is growing on sand, but I suspect there to be pebbles below it.Sea kale likes a pebble beach, but as pebbly beaches with vegetation are globally rare, sea kale is too rare for anyone to be permitted to pick. Sea holly is to be found in dunes, and if you look below you will see it surrounded by the ubiquitous marram grass, which is intended for dune stabilization, as it has a strong root network that binds the dunes together. As with sea beet, while it has edible roots it is now not eaten, as uprooting it on public land is forbidden by law, and as it is quite rare no one needs to eat it. Besides,its lovely blue flowers bless the shore with their beauty. Found on the upper shore and in wasteland near to the beach are several members of the oraches, which are often abundant and have edible leaves. Members of the goosefoot family, there are several species that are hard to tell apart unless you are an expert. But they are the kind of unobtrusive plant that you see on the shore but rarely give much attention. The same goes for the rockets, which are relations of the salad rocket that grows in gardens. Sea rocket,Cakile maritima, grows in sand dunes, while perennial wall rocket,Diplotaxis tenuifolia, grows on waste ground near the coast.Both are common and edible,but sea rocket has a slightly bitter taste to it. However, salads sometimes need bitter herbs. My final plant is sea buckthorn, hippophae rhamnoides. A shrub with beautiful orange berries, you are probably going to look, admire and not touch, it is thorny and like all plants that is said to be good for you, tastes unpleasant. Some people say that the berries are a functional food, which means that you will not enjoy eating them. Very sour tasting, so I am assured, but the chef Hugh Fearnley Whittingstall made a party drink partly from the berries, so there can be some use for them other than to feed sea birds. But I will give it a miss, the birds can have it. One plant that is becoming more popular with chefs is marsh samphire, Salicornia ssp, which is no relation of rock samphire. When I watch cooking programmes and a contestant says that they are using samphire, I become irritated and want to know which one. Too few people know that the two samphires are not related. Marsh samphire grows thickly in mudflats, and is harvested in June, and traditionally the harvest began on Midsummer' Day. Recently in East Anglia the authorities decided to let the sea reclaim some land that it was becoming impossible to protect and so they broke the sea wall. The salty sea water ebbed and flowed across its reclaimed land, and where the salt water spread,in its wake came marsh samphire, growing in the newly created tidal mud.Land lost to agriculture began to produce marsh samphire. Sea purslane, Halimione portaculoides, is a small, greyish looking plant of salt marshes. Foragers declare it edible, but it is not a delicacy, but dried it makes a salty nibble. It is abundant. Neither marsh samphire nor sea purslane are beautiful plants, but sea aster is. A member of the Asteraecea family, its blue flowers are sometimes found adorning Britain's coastal marshes. It is an annual that flowers from June to September, and is known to be edible, though who would need to eat something so beautiful? In marshes grows scurvy grass, a plant so rich in vitamin C that it was used as a palliative for the deficiency disease, scurvy. 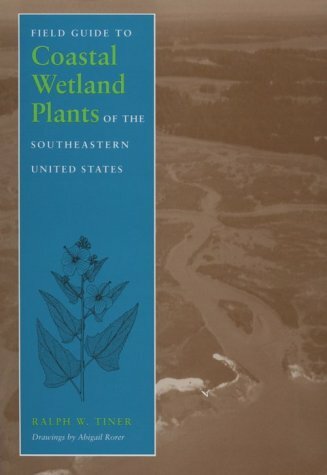 Mudflats and marshes are not the places with a rich variety of plant life, but what plants are present have a place in our lives, either as food or as beauties. I have tried to explain the most interesting coastal plants found in Britain. For reasons of brevity I have had to leave out the seaweeds, which anyway really belong below water rather than on the shore, though some cling to rocks at low tide. But anyway,modern biological thought has come to the conclusion that they are not members of the plant kingdom, and they are for another article.I have had to omit some plants that are common in the immediate area behind the coast, as they belong to a different story. Walking the coast in knowledge aids your appreciation of it. Walk and enjoy. I imagine that the shores of the Gulf of Mexico are long enough to contain a rich variety of habitats. You are right about the intertwining of nature: sea buckthorn, which I indicated is so bitter that only foraging enthusiasts tolerate it, makes great food for shoreline birds. I can see quite a multitude of planes here, as you have done an exhaustive treatment. I live close enough to the Gulf of Mexico, and in Mississippi, our neighboring state. there are grassy patches in the sand. These were fenced off years back because they are the last nesting grounds for the least turn, the smallest of the terns. The grass was protected to preserve a species. It us amazing how intertwined nature is. And the signs read "Nest in peace"
Quite right, though I think that there is an overlap between countries.For example, we have the Hottentot Fig in our sunny South West, and you have it as a naturalized species in California. Yet of the two species of sea purslane, only one is found in North America. I love the variety of flora along the coast. I imagine that what you have over there in England is different somewhat from other coastlines. I live thirty miles from the Irish Sea, but no one in Britain is far from the sea,however far inland they are. I also visit the Isle of Anglesey, where my daughter lives two hundred metres from the shore by the Menai Straits. But I would like to live near the coast. Many Britons have this wish. Unfortunately, I don't live close to an ocean or sea shore, so don't get to see these types of plants.